Noise in the workplace can often be seen as the Justin Bieber of safety concerns; while most people are now aware of it, the temptation can be to think that all you have to do mitigate the risk is to stick your fingers in your ears and pretend it doesn’t exist. Although we are approaching 10 years since the Control of Noise at Work Regulations (CoNAWR) came into force, many employers still turn to hearing protection first when attempting to protect their workers from the dangers of Noise Induced Hearing Loss (NIHL). This is despite the focus of the regulations clearly being shifted to reducing noise at source in the latest iteration of the regulations (the addition of “Control of” to the title was no random impulse by the HSE, a body not known for its moments of whimsy). The shift was deliberate, and one borne out of reason. Hearing protection, although being ostensibly effective, “fails to danger” and relies on being worn as intended by the manufacturer. Earplugs tucked behind the ears, for example, (as I have witnessed) one offshore worker do while taking a cheerful walk to a helicopter in noise levels in excess of 105 dBA, do not tend to provide the ‘wearer’ with the levels of protection quoted on the box. Earplugs need to be fully inserted into the ear canal, and hard-hat mounted ear muffs need to be ‘clicked-in’ to provide a seal, otherwise the level of protection is drastically reduced in both cases. It sounds simple enough, but in this author’s experience, one only needs to walk around almost any industrial site in the country to find examples of this advice not being followed. Even variations in peoples’ ear canal size and head shape can drastically reduce the effectiveness of hearing protection. This is why in the oil and gas industry, for example, there have been a number of claims put in over the years against employing companies by employees suffering from tinnitus and NIHL, despite the fact that most operators have long held “blanket” hearing protection policies on their sites, meaning hearing protection is required as soon as you step outside of the accommodation block. It is for this reason that the 2003 EU Directive 2003/10/EC dealing with noise in the workplace, which the CoNAWR implements, put the focus squarely on reducing risk from noise to as low as reasonably practicable (ALARP) before handing out the plugs. Following the introduction of the new regulations in 2006, much of the initial focus from industry was on re-evaluating risk assessments in light of the changes to the various “action values” that had replaced the previous “action levels” of the 1989 regulations. This reaction had some justification given the shift of the regulatory goal posts. The new action values had been reduced by 5 dBA as compared to their action level counterparts, and there had been the introduction of the new “limit value” above which all work was to cease until such time as the offending exposure could be appropriately mitigated. Employing companies felt compelled, therefore, to assess their position before deciding the right course of action. Furthermore, the regulations called for the risk assessment to be “reviewed regularly”, with the accompanying HSE guidance further defining this as any time that changes occur in the workplace that “might alter the level of exposure”; and even where no change occurred “every two years”. This requirement led many companies to become pre-occupied with reviewing and refining the risk assessment to ensure it was representative. As the years rolled by, however, this seemingly endless process of review and refinement came to be viewed by the regulator less as proper due diligence, and more as guilty knowledge. The majority of risk assessments undertaken in the oil and gas industry identify a significant proportion of the workforce as being at risk of exposure above the Upper Exposure Action Value, but the number of sites which have then gone on to implement measures to mitigate that risk is decidedly lower. In recent years, it has become clear that the opinion of the regulator is that enough is enough with regards to the refinement of risk assessments; it is time to start reducing that risk. While there are many competent assessments of risk undertaken, the subsequent assessment of controls necessary to reduce that risk to ALARP is often either missing entirely, skewed by a desire to sell a product, or based upon a finger in the air approach rather than any sound engineering practice. Proper specification of noise control on complex industrial sites requires a detailed understanding of acoustics in order to understand how and where the noise is generated and how it is being transmitted to the area. Specifying controls without that knowledge can often lead to measures being implemented that are either ineffective, or grossly over engineered so that far more money is spent than is strictly necessary. Both of these outcomes have a detrimental effect on a company’s future willingness to spend money on reducing risk by engineering means; ultimately making them more likely to turn to what they see, ironically, as the ‘safer’ (and cheaper) option of hearing protection as first resort. So how should one approach the specification of noise control that is both appropriate and effective? The first stage is to ensure that efforts are targeted in the right areas; it is at this stage that a properly conducted risk assessment can be of great benefit. Any noise risk assessment will essentially look at two key factors: the measured noise levels around the site in question, and where on the site employees spend their time in a typical working day. Analysis of this information can reveal not only who is most at risk from noise exposure, but crucially also which areas contribute most to that exposure. It is important to note that this is not necessarily the noisiest area on a site, but the one that couples high levels of noise with high levels of occupation. There is little point in spending a lot of time and money on reducing noise in an area in which workers spend little to no time during their working day. By analysing the results of the initial risk assessment it allows efforts to be targeted at the areas where they will have the most impact in terms of risk reduction. Having identified the particular area(s) causing the problem, this process of targeting noise control efforts should continue. It is at this stage that an engineering approach, backed by proper understanding of acoustics, is required. If we take the example of a centrifugal compressor, a common source of noise exposure on industrial and process sites, the package itself is made up of a host of component parts. There is the electric motor, the cooling fan on that motor (if air cooled), the gearbox, the compressor barrel itself, the coupling shafts and their respective coupling guards, the various suction, discharge and recycle pipe lines, not to mention the skid on which the whole thing is mounted. All of these elements have the potential to radiate noise. It might be tempting to think, therefore, that a full acoustic enclosure is a reasonable solution. While this may result in a significant reduction in noise, it is also most likely using a sledgehammer to crack a nut. And an extremely expensive sledgehammer at that – a full acoustic enclosure would likely cost upwards of £40,000 for design and materials alone, with something comparable in man-hours for the installation. Furthermore, such an enclosure would take up significant amounts of space, and require careful design of the cooling systems and pipework penetrations to be effective. There is also the danger in this particular example of ignoring, potentially, the most significant source on the package – the pipework – thus achieving far more modest reduction in noise than most companies would hope for given the financial outlay, but more on that later. A far more prudent approach would be to determine what the most significant sources of noise are and to target noise control at those items first. In order to derive a scheme of mitigation that is both effectual and cost effective, the potential sources of noise need to be rank ordered. This is most usefully done by determining the sound power level of the various sources under consideration. The sound power level is a measure of how efficiently a particular source radiates acoustic energy (noise). It is a function of the level of acoustic energy radiated by a source and the surface area that is radiating that energy; as such it can be thought of as a constant property of the source itself and not influenced by the environment. This is in contrast to the sound pressure level, which is the quantity usually measured by a sound level meter and is affected by a variety of factors including the distance at which the measurement is taken from the source, the environment in which the measurement is taken, how reverberant the space is, and the presence of any other noise sources in the area. By determining the sound power level of each constituent source, it is possible to determine the contribution each makes to the total noise level in an area. Since the sound power level is not influenced by any factors other than properties of the source itself, it provides a useful way to rank order sources and establish which should be treated first in order to achieve the most significant reduction in total noise level. Unlike sound pressure, however, sound power levels cannot be measured directly. Fortunately, there are a variety of methods to estimate it. Although sound power cannot be measured directly, it is possible to measure sound intensity. Sound intensity is the sound power per unit area arriving from a particular direction, and can be measured using a sound intensity probe attached to a sound level meter with the appropriate software loaded. This technique means off-axis sounds coming from other machinery can often be rejected. This allows the acoustic engineer to scan the surface of a noise source in order to measure the total sound intensity being radiated. This in turn can be used to calculate the sound power level of the equipment. Sound intensity, while a powerful tool, is not without its limitations. Measurements taken in highly reverberant space, or where there is a considerable amount of extraneous noise present, can result in reduce the accuracy of the measurement. An alternative is required to complement such methods. In these instances, and where the dominant noise generation mechanism is radiation of noise from a vibrating surface, the sound power of a particular item can be established by measuring the vibration velocity level. ISO TS 7849-1 “Determination of airborne sound power levels emitted by machinery using vibration measurement” gives a detailed description of the method. In application of the method, equipment items under assessment are broken down into separate radiating surfaces, and the surface vibration velocity is measured across each. The sound power level of the source is then determined from the surface vibration velocity level, which can be used to calculate the sound power level, given an estimation of radiation efficiency. By using the techniques described above it is possible to determine which of the noise sources on a complex piece of machinery is most responsible for the overall noise level in an area; the result is not always what you might expect. Returning to the example of a centrifugal gas compression train, it might be intuitive to think the compressor barrel itself is the most likely candidate for noise control, or perhaps the motor? In fact it is rare for the compressor barrel to feature in the top 10 noise sources once rank ordered by sound power level. They are one of the physically smaller elements on the package, and crucially, they generally exhibit an extremely stiff structure that is a poor radiator of acoustic energy. The motor may indeed be a significant source, but this will partly depend on the cooling mechanism, as air cooled motors with a cooling fan tend to be significantly noisier than their water-cooled counterparts. Probably the most common culprit as the noisiest element on the package is the pipework, particularly on the high pressure, discharge side of the compressor. In this case, opting for a full acoustic enclosure would not only be hugely expensive, but might not actually solve the problem as the vast majority of the pipeline sits outside the enclosure. In fact, it can be possible to reduce noise levels and exposure significantly by simply fitting the pipeline or lines in question with an acoustic pipe lagging system or silencer. The exact specification of the lagging or silencer will depend on the frequency content of the noise being radiated – information that should be available from a properly conducted measurement exercise. Another, less obvious, candidate for the most significant noise source can be the equipment skid. If not properly isolated, the rotating machinery on the compressor package can transmit audible frequencies into the skid, which are then re-radiated by the larger surface areas of the equipment skid and drip trays. In this instance, due to the structural characteristics of the panels that make up the skid, the re-radiated noise is of considerably higher level than that being transmitted directly by the moving parts that generate the energy – in much the same way as the body of a guitar transmits sound that is much louder than that emitted by the strings. Here, noise could be drastically reduced by the application of a constrained layer damping system, which would be many thousands of pounds cheaper than opting for a full acoustic enclosure. Ultimately, the job of the acoustic consultant is certainly not to blind the client with science – quite the opposite. Noise control options should be presented in a clear, uncluttered way, providing all the information for detailed cost-benefit analysis to be undertaken. But the science has to be there to give substance to that information. Even if after all the diagnostic work has been carried out and the cost-benefit analysis undertaken, the control options presented can still be rejected, but at least those decisions will have been based on sound advice. In contrast to many other safety issues, the effects of noise are rarely felt immediately, but rather creep up over time. Yet the risks are real; if you listen to any testimony from a person suffering sleepless nights from long term tinnitus, or from one who cannot join in on a conversation in a restaurant due to NIHL, you will know it is not a pleasant experience – let alone the very real risk associated with an inability to hear warnings in a high noise environment. Hearing protection will always have a central role to play in protecting people against the harmful effects of noise, as clearly when used properly it provides a high degree of personal protection. Moreover, it is important to note that, on a large number of industrial sites, reducing noise to as low as reasonably practicable will not constitute reducing it to a level at which it is safe to be exposed for long periods. 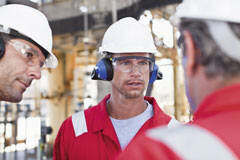 Therefore, even where properly specified noise control has been implemented, hearing protection may still be required to mitigate the residual risk. As with any other health and safety concern, however, personal protective equipment (PPE) should not be the first recourse to risk. It is perhaps the gradual, cumulative nature of noise exposure effects, which makes people more susceptible to lapses in vigilance with regards the use of PPE. It is not so much that people just have a cavalier attitude; it is simply that the consequences of not wearing hearing protection are often not immediately felt. Hitting your finger with a hammer is a stark and painful reminder to wear gloves next time, which lingers long in the memory. This is not necessarily the case in forgetting to wear earplugs. By the time you feel the effects, it is probably too late to do anything about it. Ultimately it is for this reason, rather than concerns over regulatory compliance, that where possible we should look to reduce noise rather than simply cover our ears.